I was recently in San Francisco and was fascinated by the new Bay Bridge. Now, I’ve crossed the old bridge many times. It did what it was supposed to do – get me from here to there. This new bridge didn’t seem like anything remarkable; in fact, I barely noticed the change at all… until late in the evening. As I looked out the window of my hotel, I saw it… the lights. They were glorious. I was struck by how dynamic that bridge was: functional and beautiful. It made an impact. So I went online to learn a little more. Now, it still goes from here to there, but did you know that this “epic transformation… into a global icon” does a few other cool things too? For the first time, it meets the needs of many with pedestrian and bike lanes. It got me thinking about work. When you’re new to an organization or are working with a team or client, you’re constantly building connections and forging relationships to “get you from here to there.” We’re building bridges. Everyone has their own style. Each team has its own dynamic. Each project has its own deadline. Oftentimes, we are so caught up in “our” style, the dynamics of the team as they exist today (or did in the past) and the deadline that we don’t pay as much attention as we should to those bridges we’re building. Yes, those bridges – those relationships – are functional. They help us learn the ropes, motivate the team or achieve the goal. But a bridge is much more than that. It’s our connection from the past to the future, from where we were to where we want to be. It’s a place we will turn to again and again… a place that will be familiar and somehow new. Help people meet many needs. That will only happen though, if you invest as much (if not more) time, focus and care into building lasting relationships as you do in the short term projects and personal objectives. And frankly, I believe your style in leadership and teamwork is pretty darn important too. Your teammates will get things done when focused on a goal. How many of those people will be there – years later – if you don’t invest in them as well? How many people will be there if they don’t feel respected? Don’t feel valued? At the heart of each of us, we want to feel loved – feel appreciated – feel valued. We want to have a meaningful impact on the lives of those we touch and the things we are working to achieve. We want to know that other people care. We want to build deep, real relationships: not with people who ask passing questions and forget your answers, but instead with those who invest their lives in seeing you succeed and thrive, professionally and personally. Yes, bridges and relationships can be built that get you from here to there. How solid are those bridges though? Are you sure they will stand the test of time? Or are there warning signs that you may be ignoring? In my quest to learn more for this piece, I read about the Quebec Bridge. It was an engineering marvel, but there were warning signs along the way that were ignored. It didn’t end well, collapsing in 1907 and costing lives. It could have been avoided. The problems could have been corrected. It could have dazzled. It didn’t. What bridges are you building today? Are they strong? Can you do more? What bridges did you build years ago? Are you maintaining them? Will they be more? 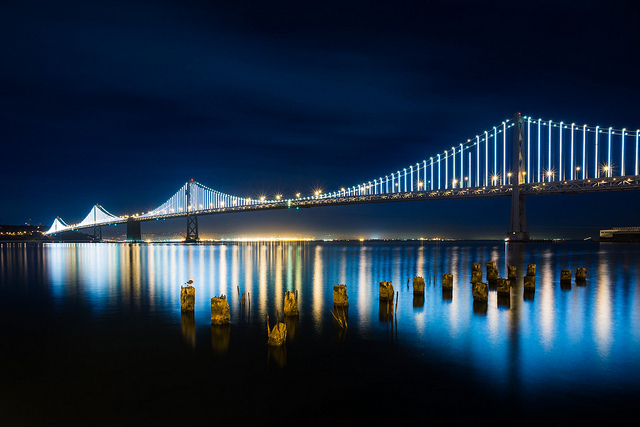 Tags: Bay Bridge, Bridges, Business, Personal Style, Relationships, Teamwork | Permalink. Well I do like your analogy, I also looked at it visually, as you can see the bridge has ups and downs, from the heights of the towers, down the suspenders, to the deck one thing is constant, the main purpose. Its main purpose is to hold up the road and allow passengers to cross. We as leaders can have our ups and downs, we can make our mistakes, but so long as we remain true to our level purpose, our strength remains. Very true, Ryan. I agree completely.